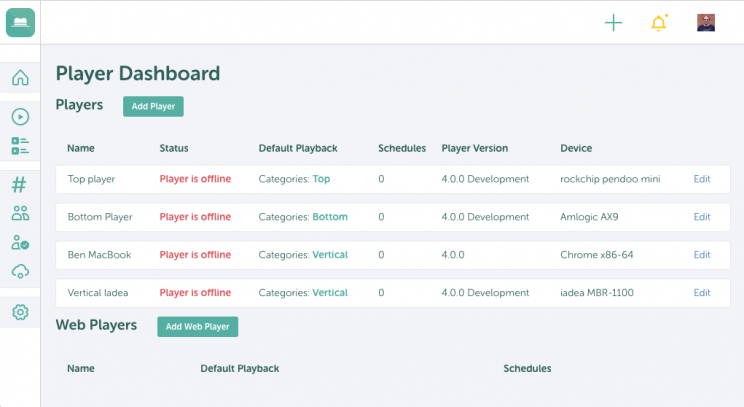 Player Dashboard allows you to monitor and manage all your players from one web-based console. It gives you an at-a-glance view of which players are working and control what they are playing back. To get started with Player Dashboard, make sure you have at least v4 of the TrilbyTV Player app installed. On the TV screen, you will see a Player Code – this is unique to that playback device (although it will change if you delete/reinstall the app). Make a note of this code. Click the Player Dashboard icon in the TrilbyTV navigation bar and click the Add Player button. Enter the code you noted down, and then name the player. Once you’ve done this, you can configure your player. Click Edit on the Default Playback row and select your categories, playlist or single item to playback, and set any other options available, such as Shuffle or Limit videos. Remember to click Save when finished. You can add other schedules to play back different content at different times, Home time messages between 14:45 and 15:45 for example. Just click Add Schedule and select your categories, playlist or single item to playback, and set the times as well as any other options available. On the Edit Player screen, you can change the name of your player, as well as see the current device, OS and app versions, as well as the time it last checked in. Players should be checking in once every minute. You can choose Copy Settings to replace the current player settings with those from another player. This makes it easy to add a new player device and use the settings you already have in place on another device. You can also use the Import/Export buttons to save your current player settings. This allows you to save and reload settings. Click the Export button to download the current player settings. You can then use the Import button to upload that file again and replace the current Player settings with those from the file. Note that if your settings refer to a playlist or categories that don’t exist, they will be missing after the import.